The most popular graphics package in the world is much like the most popular search engine in the word. The name of the package isn’t just a noun, it is now also a verb. When you want to find information about something you don’t just search on the internet for it, you Google it. The ability “To Google” didn’t exist 20 years ago but it is now a term used daily in the office in which I work. For instance “The program keeps crashing with a strange error”, “Have you tried Googling it to see if there is a solution”. Other search engines don’t have the same clout. You don’t hear people say “Have you Bing’d it?” or “Have you Duck Duck Go’d it?”. The most popular graphics package is Photoshop. Any picture that appears to be doctored in any way is now said to be “Photoshopped”. Photoshop is a difficult act to follow and the closest thing that Linux has to Photoshop is GIMP. Expecting somebody to move from Photoshop to GIMP is probably as difficult as getting somebody to switch from Google to Bing. It doesn’t matter how good GIMP is it probably isn’t going to happen. GIMP users though are also unlikely to switch to Photoshop. There is a category of user though that couldn’t care less about either Photoshop or GIMP because there are just too many features and the learning curve is just too high. Some people are more than happy drawing pictures or editing basic images using Microsoft Paint and that is what this article is about. Linux has a number of applications that provide similar functionality to MS Paint and in this article I will be looking at 8 of them. 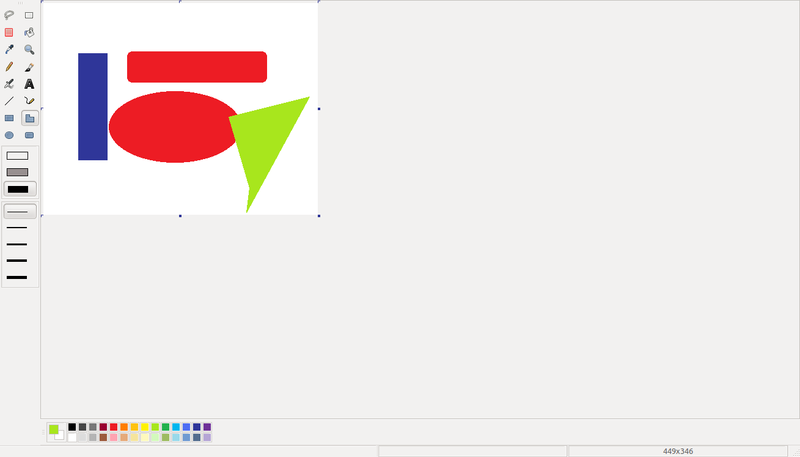 To be able to compare Microsoft Paint with some Linux alternatives I thought I would start off by showing the features of the latest version of Paint. Paint is one of those programs that hasn’t changed much over the years but the latest version in Windows 8.1 does have the now standard ribbon bar.The ribbon bar has a number of shapes to choose from and they can be drawn onto a variable sized canvas. The lines for the shapes can be set at varying thicknesses and can be one of a preset colour palette or a user defined colour. The shapes can be filled in or left empty. Text can be added to the canvas. The text can be set to one of a number of fonts, font sizes and styles such as bold or underline. The image can be resized and saved in a number of different formats. There is nothing particularly special about Microsoft Paint but it is a good toy for kids to play with. It can also be used for resizing images and for adding funny captions to photos. Imagemagick doesn’t look anything like MS Paint and it is much better for editing photos than it is for drawing images. You can create a canvas in the same way as you can for MS Paint and you can add all sorts of shapes including triangles, rectangles and circles. The width of the lines can be adjusted and you can fill in the shapes using different colours. There are some nice effects such as wavy lines and bricks that can be used to fill shapes and as you can see in the image above there are some nice shading effects. One feature that appears to be missing is the ability to add text. 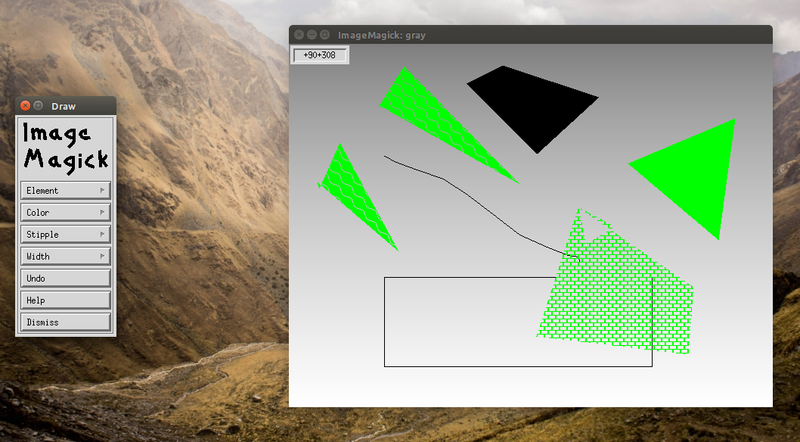 Image Magick doesn’t look as clean as MS Paint but it is easy enough to use. I don’t think it would suit younger children in the same way that MS Paint would. 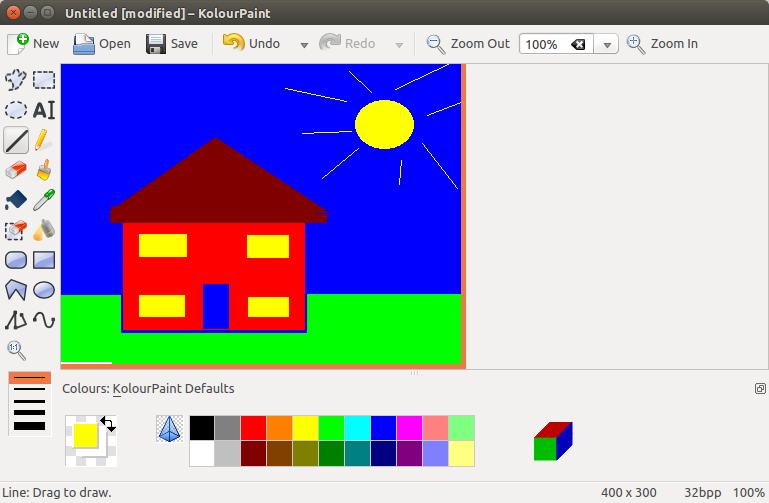 As part of the KDE desktop, KolourPaint looks much like the versions of MS Paint that would have been released with Windows XP, Vista and Windows 7. 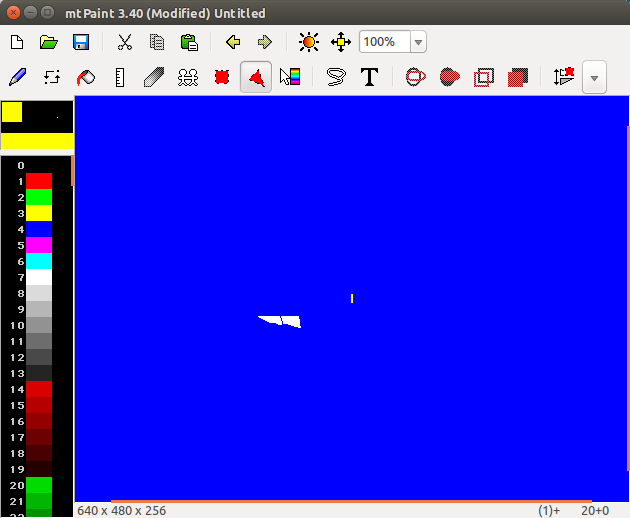 This is probably the closest package that I have found to Microsoft Paint on Linux. The package is lacking the predefined shapes that come with Microsoft Paint but you can create basic rectangles, circles and polygons. There is also the ability to add text with varying fonts. You can resize images using KolourPaint and save them in a number of different formats including JPEG, BMP and PNG. This is an ideal package for kids to use for creating pictures. I found MT Paint to be horrendously difficult to use which begs a question, “Who is it for?”. The toolbar has a number of tools including the ability to paint, select shapes, fill shapes, draw straight lines, clone, make a selection, make a polygon selection, add a gradient, lasso selection and add text. The issue I found was getting it to keep any of the selections to hold and then to fill the selections with colours. It just isn’t very intuitive. You can resize the canvas and adding text was simple enough. The image can be saved in a number of different formats although JPEG doesn’t appear to be one of them. Gnome Paint is the Gnome equivalent of Kolour Paint. At first glance Gnome Paint looks much the same as Kolour Paint and older versions of MS Paint. There are tools for drawing, erasing, and selecting shapes including circles, rectangles, rounded rectangles and polygons. Gnome Paint works quite well but there are a few issues. First of all there appears to be no way of editing the colour palette so you are stuck with the 32 colours. If you select the text tool a message appears stating that this function is not yet available. It isn’t obvious how to finish editing a polygon. You basically continue selecting the shape until you are finished and then right click. There are no clues that this is the case and it is fairly unintuitive. Gnome Paint could also do with some tool tips so that it is obvious when picking an item in the toolbox what that tool does. 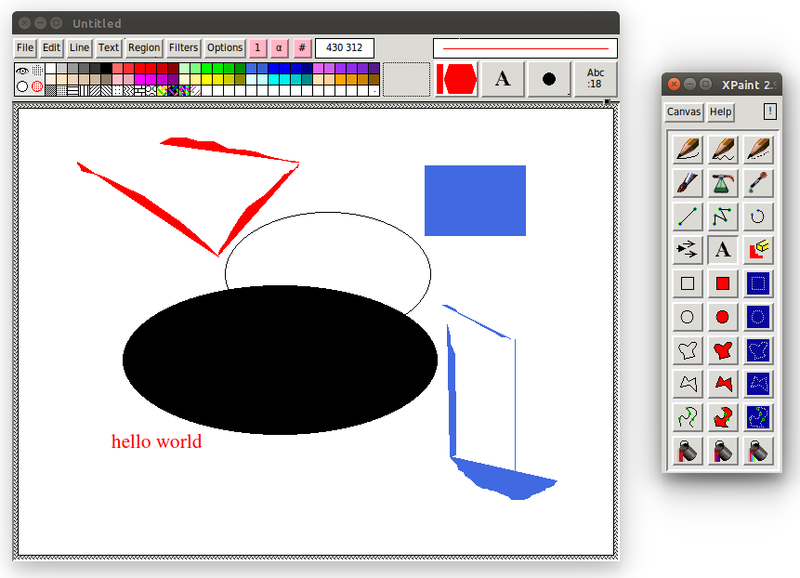 GNU Paint is another drawing program that looks and acts much like MS Paint. The actual design is more basic than Gnome Paint but functionality wise it is more advanced. You can create basic shapes such as rectangles and circles and you can add free format lines. The colour palette enables you to add more than the default 32 colours and the text function works. Not quite as easy to use as Kolour Paint and it is a shame that there is no undo feature. Your average child would get to grips with it in no time at all. 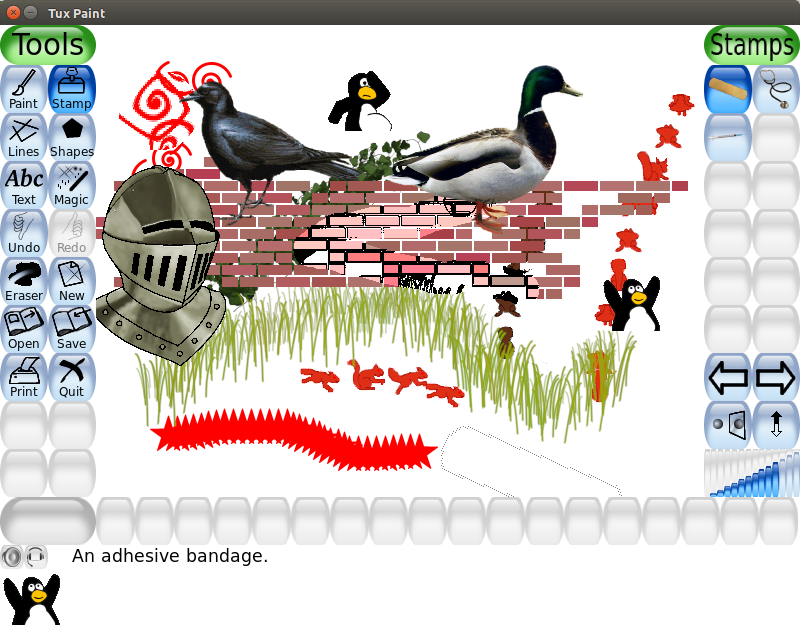 Tux Paint is unique compared to all the other packages and clearly the target audience is children. The Tux Paint package is great. Not only can you add the standard shapes such as circles and rectangles but there are a whole host of effects that can be added such as grass, rain and bricks. There is also a number of pre-defined images or stamps that can be added including Tux the penguin. Do you remember Deluxe Paint from the Commodore Amiga? Grafx is a clone of that package. Some things from the past belong firmly in the past and in my opinion the Deluxe Paint way of doing things is definitely in that category. The application is far too difficult and convoluted compared to many of the other packages. I couldn’t get to grips with the software at all. The mouse would get lost on the screen and even doing something as simple as changing the canvas background was too challenging. I could have read the manual but I couldn’t get the mouse to behave long enough to click on the icon. XPaint provides a good balance between functionality and ease of use. There is a canvas and a toolbox. Each shape can be filled in or left hollow. There are a plethora of colours to choose from and you can define your own. The text tool works well and there are even a few extras including filters. The shapes to choose from include rectangles, circles and polygons. The best and most complete package was Tux Paint. 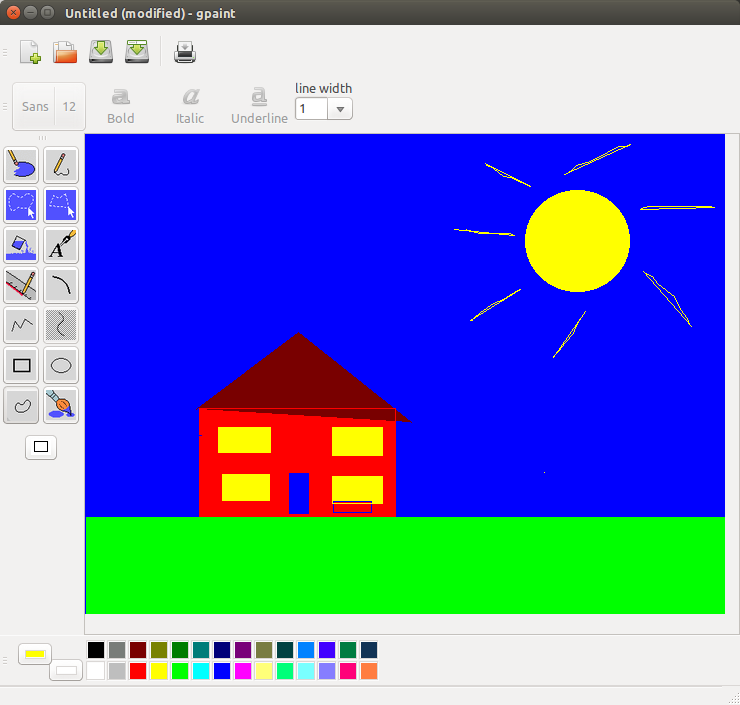 It isn’t a clone of MS Paint and has far more features, yet it is still easy to use. The next best was Kolour Paint. It was more in line with the traditional paint package and included most of the features of MS Paint except the colour palettes were limited and there weren’t as many predefined shapes. XPaint is also a decent enough application for basic drawing purposes. Image Magick and GNU Paint were both reasonable but not really spectacular. Image Magick is much better utilised for basic image editing such as cropping and resizing photos. Gnome Paint wasn’t as polished as Kolour Paint but given a bit of love and care could easily be improved. MT Paint, well, I’m not sure what the purpose of MT Paint is and Grafx is just overly confusing with no really good selling point. Kolourpaint is excellent for what I need: light editing and image resizing. I have tried many of these packages, because I don't use the KDE desktop, and I don't like adding to my system all the dependencies kolourpaint needs. Pinta sometimes does the job, but others is very frustrating. I find the rest useful only for children, if they work at all. I always return to kolourpaint. 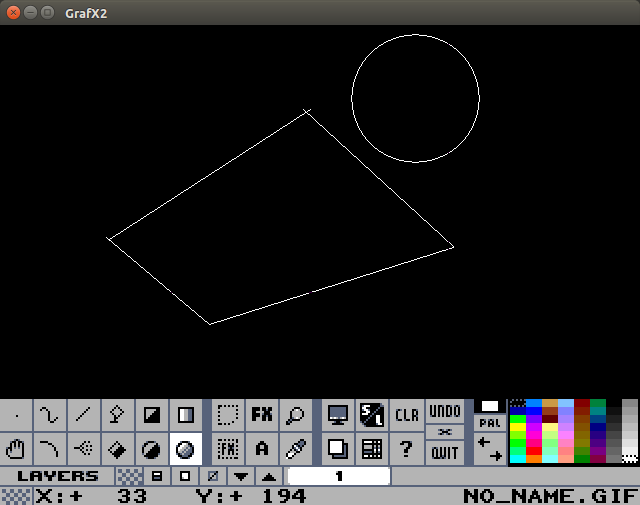 Any online graphical tool can be used in linux as well. In that case creately can be a best visio alternative for Linux. Its a online diagramming and collaboration software.